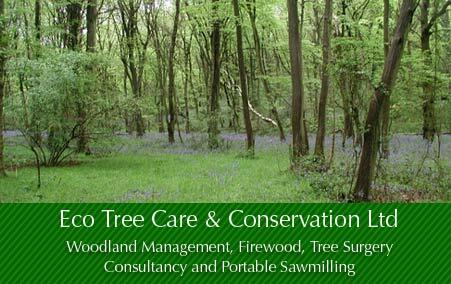 Eco Tree Care & Conservation Ltd was a professional arboricultural business first started in 2002 in a beautiful part of rural Hertfordshire which then relocated to Cutlers Wood in the Kent Downs Area of Outstanding Natural Beauty. It was a family business ran by Martin and Katey Hugi who have a love of nature and our environment that stems from a life-long interest and involvement with the natural world. 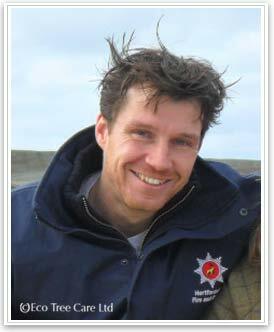 Martin now works for The Woodland Trust as their Ancient Woodland Restoration Project Manager, covering the South-East and East of England. Martin originally graduated as a chemist in 1994 and worked within various physical, analytical and computational chemistry roles within the industry. Towards the end of the 1990's, coming to realise that for him being in a laboratory every day was not something that was going to make him happy long term, Martin decided to leave his job and spend the time looking for work that might prove to be more fullfilling for him. Martin started a job as a trainee arborist after a few weeks and he started reading and studying arboriculture. He has never looked back. After working as an arborist for some years Martin set up his own arboricultural business 'Eco Tree Care & Conservation" in 2002 operating from a working farm in Much Hadham, Hertfordshire; an area in which he grew up. At this time Martin started to become familiar with the ideas of Ben Law and Woodsmanship and became to understand the revival in woodland management at a local and landscape level in a sustainable yet profitable way. Eco Tree Care between 2002 and 2011 grew from a one-man band to a small company employing up to 9 people during large projects. The business became a limited company in 2007 and became involved in all aspects of tree management and tree care; from amentity trees to woodlands; to estate trees; to orchards and managing the by-products, to planning and planting woodlands, native hedges and orchards. Other services developed including; sawmilling, timber recovery, firewood, craft products, charcoal and kindling. Over time, and with qualification, consultancy services became possible, including; tree inventory surveys, tree safety and defect inspection, tree works recommendation, woodland management plans and grant scheme applications. Martin also worked between 2003 - 2006 on contract as a free-lance regional manager for a Woodlands Investment Management company. Katey, his wife, joined the business in 2006. She started life in Cornwall then moved to Worcestershire where she grew up as a young girl with a large orchard at the bottom of the garden. This spurned a life-long love of apples and orchards. Katey, started her working life in the city, for 7 years, acquiring business and managerial skills before leaving the city to work in Project Management roles for a major international company for a further 4 years. Upon meeting Martin and working within Eco Tree Care & Conservation Katey felt able to make a life-changing move, to leave the corporate world and pursue her passion for all things natural. She brings a love of apples and orchards, project management skills, accountancy and a settling and supportive influence. Katey has worked hard to structure the business and bring a level of maturity to the project planning, organisation and management as well as being involved in the day to day hands on work and activites. Katey has become involved with the research and planning of her beloved orchards. This has opened doors to working with local social enterprises directly working and restoring local heritage orchards. 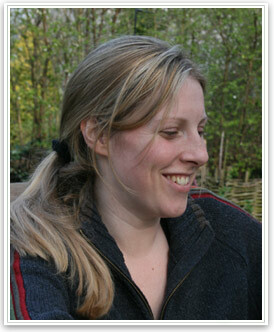 Katey's vision includes forest schools and social enterprises based on the woodland economy. This culminated in 2012 with the setting up of a pilot Forest School with Chilham St Mary's Primary School. Katey has recently started as a Business Management Consultant with a local coach and bus company overseeing its merger with a recently acquirred business. From the beginning the principles of the business were for socially conscious enterprise that neither exploited nature or others which has led to the Eco Tree Care becoming a well established arboricultural and woodland business with a reputation for professionalism and integrity. 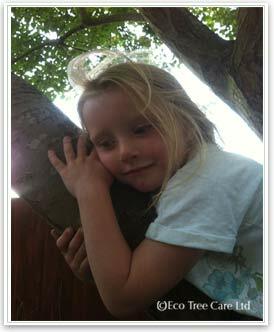 Ella-Louise, the youngest member of the business, keeps a close eye on the long term strategy, helped give the business it's long term direction and climbs and hugs trees in her spare time. In Hertfordshire we rented a stunning, near derelict, old oak barn on the large Moor Place, 800 acre country estate owned by the Norman family, where we also had the use of adjacent farm and yard areas. Unexpectedly the estate was put up for sale in 2009 and in 2010 it was bought by a developer who specialises in barn conversions, our lease expired to coincide with the completing date of 29 July 2011. Although the developer failed to complete on this date and the sale is still ongoing the old oak barn is likely to eventually be converted into, what will be, a very desirable home or homes, albeit at the expense of a working farm. Martin and Katey, after some sadness at realising that we had to leave the barn and go through a business upheaval recognised that this was perhaps a very good opportunity to re-check the business direction, its development and transition. With this in mind the business was downsized and from September 2010 Martin took on managerial role as a Consulting Arborist for a large Arboricultural, Ecological and Planning Consultancy whilst looking for potential woodland possibilities. Katey set about advertising in the national press, including 'The Telegraph', 'The Times', 'The Lady' and 'Country Life'. Below are a selection of our adverts that ran from the end of June to early July. Rob Thomas the present custodian of the 43 hectare Cutlers Wood in Kent saw our advert in 'Country Life' and called us on Sunday 10th July. Over the next few days Martin and Rob talked on the telephone of a potential collaboration, a couple of visits were made to Cutlers Wood and the adjoining Cutlers Farm and they both came to realise that they shared a synergy of ideas and a similar vision for Cutlers. The following weekend Martin met up with Rob to talk further face to face and after two more visits to Cutlers it was agreed to make the business move to Cutlers Farm in order to help manage Cutlers Wood long-term. Cutlers wood is 103 acres of ancient semi-natural broadleaf woodland in the Kent Downs Area of Outstanding Natural Beauty (AONB). Much of it is overstood sweet chestnut coppice in need of bring back into rotation. It backs onto and is joined to the ancient and historic Kings Wood currently managed by the Forestry Commission. The long term aim when we moved to Kent was to open up Cutlers Wood as a public access point into the Kings Wood Woodland and for Cutlers Farm to provide the base for a Woodland Activity and Awareness Centre from where to start. The owner Rob wanted a visitors centre and to encourage paying public into his woodland. Katey and Martin trained and qualified as Forest School Leaders and set up a Forest School with the local primary school and set up glades and areas within the woodland. The coppice was brought back into rotation. Due to unforseen circumstances this venture did not meet expectations and it dawned on us what we had left behind, beautiful people, beautiful countryside and our 'home', so this time it was with great joy that we moved back to Hertfordshire. The services that we are offered. Tree surveying, safety inspection and tree reports.